Thinking Anew: Harnessing the Power of Belief is now listed in The Addiction Recovery Guide. This comprehensive online resource assists individuals struggling with drug addiction and alcoholism find help that best suits their needs. The tragic death of a brilliant young writer named Jacob Waletzky* from a cocaine induced cardiac arrhythmia at the age of 29 inspired the creation of this website. The Addiction Recovery Guide is produced and funded by Lucy Waletzky, MD, a psychiatrist who is Jacob’s mother and fellow of the American Psychiatrist Association. She is assisted by Marsha J. Handel, a medical librarian at Beth Israel Medical Center. *If you have an interest in the books contents, you can sign up for a free copy of Distortion Lens, Jacob Waletzky’s unfinished novel about a young Mormon who tries to save his atheist brother Gordon from his heroin addiction. Buy the Thinking Anew Composition Book. Bonus! Download our Weight Loss & Diet Mantras for free. Click here to view and download our weight loss mantras. 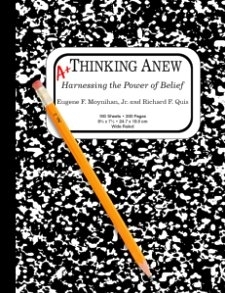 Buy the Thinking Anew Composition Book safely and securely via PayPal or Credit Card, for $14.95 + $3.99 shipping. © Copyright 2014 Thinking Anew. All Rights Reserved.